Yen is pressured because of the Bonds market growth and USDJPY will be under the influence of some economic reports in the US such as TIC Long-Term Purchases and the NAHB Housing Market Index. After two strong pullbacks, USDJPY is continuing its bullish trend. The support rests at 105.080 with resistance at 106.160 which both lines are above the weekly pivot point at 103.870. The EMA of 10 has risen sharply and it is above the EMA of 100. 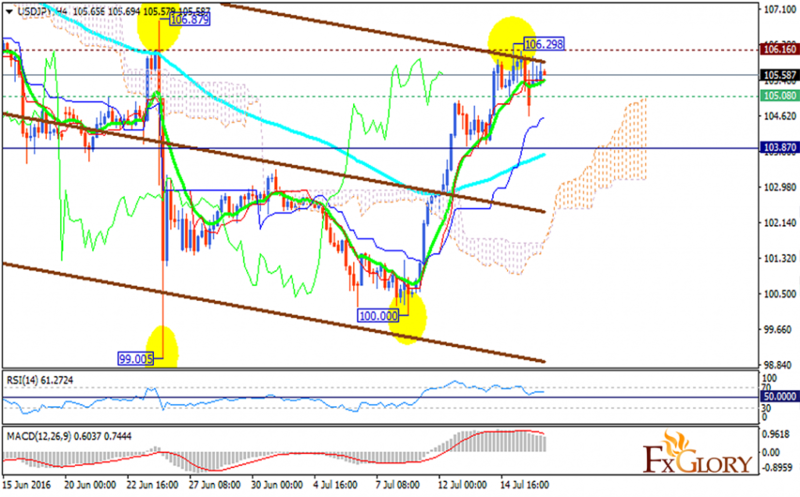 The RSI is moving above the 50 level and the MACD indicator is in positive territory. The price is above the Ichimoku Cloud and it is above the Chinkou Span. The Tenkan-sen is showing a horizontal movement while the Kijun-sen is showing an upward movement. The pair will grow to 107.00 so long positions are recommended at the moment.